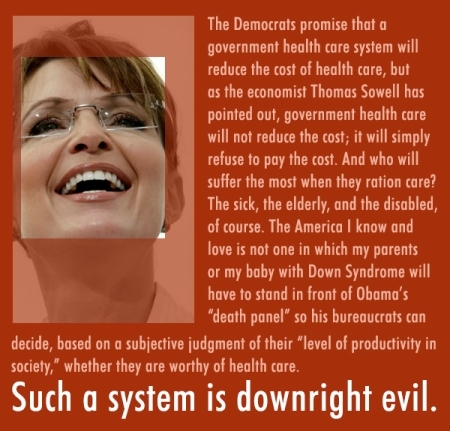 Remember what Sarah Palin said about the death panels in Obamacare? Liberals INSISTED this wasn’t true. They claimed it was ridiculous. The phony liberal “fact checking” website, Politifact, even called it the “Lie of the year.” But now that Obamacare is about to go into effect, Howard Dean is publicly admitting that Sarah Palin got it right even though, of course, he’ll never give her the credit she deserves. There does have to be control of costs in our health-care system. However, rate setting–the essential mechanism of the IPAB–has a 40-year track record of failure. What ends up happening in these schemes (which many states including my home state of Vermont have implemented with virtually no long-term effect on costs) is that patients and physicians get aggravated because bureaucrats in either the private or public sector are making medical decisions without knowing the patients. Most important, once again, these kinds of schemes do not control costs. The medical system simply becomes more bureaucratic. PALIN: Well, you know, it wasn’t just me saying there were death panels in Obamacare back in 2010, I mean anybody who could read could read into that, it’s a faceless bureaucratic panel that will decide based on a human being’s level of productivity, a subjective and political decision being made as to whether they deserve medical care or not. Yes, that little girl is a prime example of a bureaucrat being able to make that decision. It’s a scary thing. HANNITY: And now even Howard Dean is acknowledging this. Howard Dean? What did you make of the op-ed that he had out there? PALIN: I haven’t read his op-ed. I haven’t wasted my time on it. I think I, and others, wasted too much time listening to the liberal pundits a few years ago when they said that was the biggest lie of the year, my claim that death panels were a part of Obamacare and the rationing of health care services. And now that has been proven to be true. I guess I could say, ungraciously that I appreciate Howard Dean acknowledging it, finally. Obamacare is nothing but disaster piled on top of disaster. It’s causing businesses to avoid hiring, people are losing their insurance, costs are exploding, doctors are talking about quitting their profession — and then there are the death panels. If Obama’s goal was to destroy the health care system in America, he couldn’t have done a much better job than this.